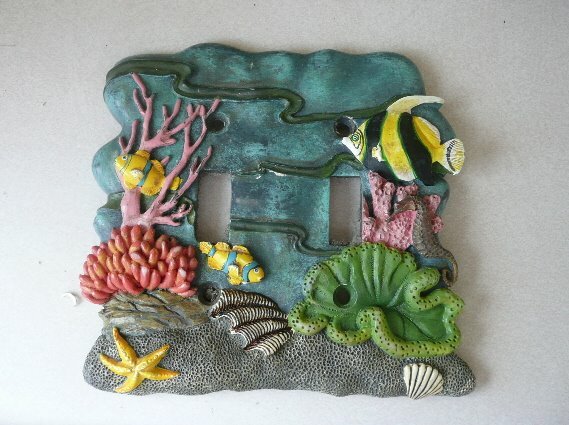 I have 2 2-hole switch-plate covers available. These were left behind by the previous owners. Both are heavy-duty ceramic and are in great condition, just not my personal style. If you want one of these, please leave a comment on THIS post, specifying “lighthouse” or “fish”, with your e-mail address so I can contact you for your mailing address. In the spirit of RAK, I will probably include a stitched piece in the theme you choose. Yes, I already have ideas. Poll – which color scheme should I use in my master bedroom? Never seen anything like them before. Were they in chldren's bedrooms? Pleaase dont enter me in the draw. 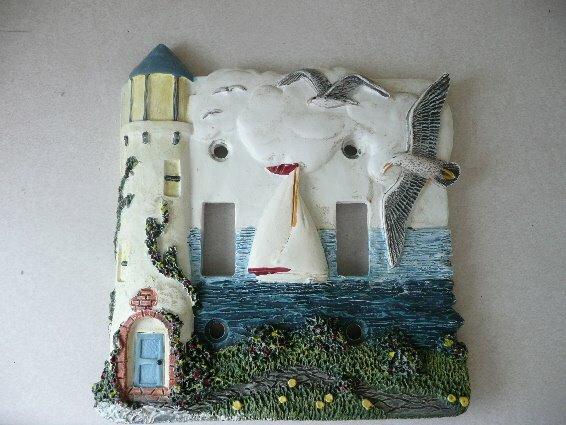 One was in the living room (lighthouse theme) and the other was in the bathroom (fish and frog theme). They ARE a little cutesy for my taste. And they may only fit U.S. light switches. I don't know about those things. Lighthouse one is gone! To my aunt! Duh, ask family first, at least they read my blog! The fish one would be perfect for my dad's bathroom if it's still unspoken for.